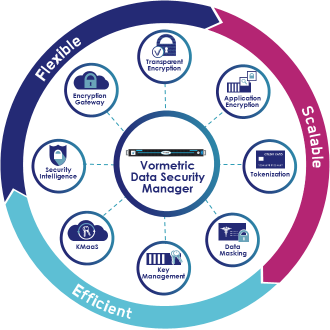 Thales Vormetric allows organizations to encrypt all structured and unstructured data (data at rest) with one singular system. Key management and access policies are handled by a FIPS 140-2 Level 3 protected Data Security Manager. Agents on the target systems are responsible for transparent data encryption and decryption in the background. Data masking and tokenization are supported as well. The Data Security Manager is available as FIPS 140-2 Level 2 certified hardware or as virtual appliance, if permitted by the security requirements. The picture below shows some of the different target systems of Vormetric. Windows and all flavors of Linux/Unix are supported. Additional Information: Migration from RSA DPM to Vormetric.